We started out brioche dough last week and left it in the freezer. Brioche is a very enriched french pastry dough – the french pastry dough, in fact. I discovered that I thought I had had brioche, but I was wrong. 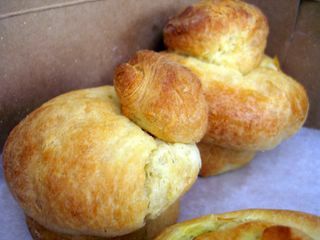 It seems that many bakeries, at least here in the US, simply pass off their challah breads as brioche. In reality, brioche has more of a pound cake texture than challah and involves about twice the amount of eggs and butter (though oil can be used in challah instead of butter). The dough is also very unusual in that you cannot overwork it. I mean, it is possible, but that would take an extremely long time. This is also not a bread I would recommend making without a stand mixer. What you need to do is mix the yeast, liquids, eggs and flour until shiny and silky, which will take anywhere from 10-15 minutes. Add the butter in gradually and beat until fully incorporated, which will take an additional 10- 15 mintes in your mixer. The dough will look very strange and stringy, like spiderwebs. It will feel very sticky and will be able to stretch out quite a lot if you pull it. Let the dough rise – no need to grease the bowl because of the amount of butter in the dough – overnight in the refrigerator. This is crucial as you want the air bubbles to develop slowly. You must slow rise brioche! Also, it’s easy. Let the dough come to room temperature, shape it and let it rise a bit before baking. Brioche is so rich, as a bread, that it should be baked at a fairly low temperature (350F) to prevent scorching. Dissolve yeast in warm water and let stand for 5 minutes, until foamy. Beat eggs lightly with a fork and set aside. Place flour, sugar and salt in the bowl of an electrice mixer. Mix briefly to inforporate. Add yeast mixture to flour, along with approximately 2 eggs. Mix until the dough resembles pie dough, then slowly add more egg. Once all the egg has been incorporated, continue to run mixer until dough is shiny, smooth and wet. It will cling to the sides of the bowl in ribbons. This will take 7-10 minutes. Cut the butter into 1-2 tablespoon chunks and add to dough. Mix until butter is completely incorporated. Dough will be very stringy and elastic when mixing is complete. Place into a large bowl (unoiled), cover with plastic wrap and let the dough begin to proof for 1 hour. Place bowl in the refrigerator for 12-24 hours. This dough must slow rise. Remove chilled dough and let it come to room temperature before shaping and baking. After shaping, let dough rise a second time and glaze with an egg white to produce a nice shine. Muffin sized brioches, similar to the ones shown above, will take about 20 minutes in a 350F oven. We made both traditional brioche and pain au raisin with our brioche dough. 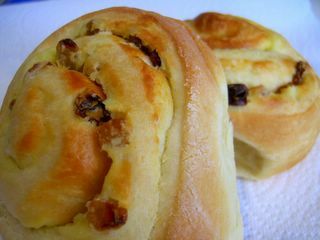 For pain au raisin: roll out the brioche dough, spread it with vanilla pastry cream and sprinkle it with a healthy portion of rum-soaked raisins. Roll it up like a jelly roll, slice into 1 inch rounds and let proof until doubled on a baking sheet. Bake at 350F for 20-25 minutes, until golden. Nic, it is so nice for us to also get a baking class from you. I am not sure when I will have time to try all the breads I’m learning in your blog. Tomorrow I’ll have 15 cubic yards of soil delivered and by the time I’m done in the garden, just about every day for a while, I’ll be too tired to do much else. But I just wanted to let you know how much I’m enjoying reading about all these breads. I do love breads and unfortunately my hips show, and up to now I’ve been more of a buyer than maker of breads. I don’t count the bread machine, of course. Your posts are getting me enthused to start really making my own bread. Brioche has been on my “to make” list for quite a while. Thanks for the inspiration! Nic, Brioche dough just about melted my poor little Kitchen Aid (the little one, not the pro size). I ended up buying a Electrolux Assistent Mixer that kneads thick doughs like the Brioche dough and haven’t looked back! Nice to meet another ‘bread head’! Can’t wait to see what is next in class! Ana – Thank you. I love writing up all the info from my baking class because, in addition to loving to help my readers and blogging friends, it helps cement the knowledge in my mind! I’m glad you’re getting as enthused as I am. When I started baking bread, I didn’t realise that I would enjoy it as much as I do. Melissa – One of the women in my class broke a mixer while were were working on the dough. Good call, upgrading. I kept my mixer on a low speed, working with the “slow and steady wins the race” mantra in mind. Those Brioche look so amazing. I don’t think I’ve ever seen anything quite so impressive! I will try to have a go on Sunday. I am still quite wary about using yeast!! If one day, I do try out I will let you know! Hi Nic – I’ve been wanting to try baking brioche, but I’m a bit scared that I might fail (and be devastated). Yours look amazing and perfect, I’ll come back to your recipe when I try. Thank you for sharing. I have been a silent lurker in your blog for quite some time. Have gotten to know your blog through some other blogs that I visit. Just wanna say that your work is awesome & inspiring. Btw, the flour mentioned here is ap flour or bread flour? Je vous merci pour votre recette. How do you form the bread if you want to just make it into a loaf? And do you bake in a loaf pan or on a cookie sheet? Carlee – You can put it in a loaf pan (you might need to split it between two pans). I can’t remember the exact baking time off the top of my head, but it’s probably around 45 minutes or so.